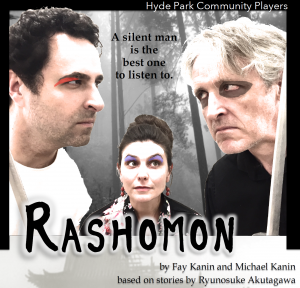 Based on the short stories of Ryūnosuke Akutagawa and inspired by Akira Kurosawa’s film of the same name, Fay Kanin and Michael Kanin’s play Rashomon turns the story of a violent encounter into an exploration of the nature of truth itself. One day, on the road to Kyoto, the bandit Tajomaru rapes a samurai’s wife. The samurai himself later turns up dead. And everyone–the wife, the bandit, even the dead man–has a different story to tell about who killed him and why. On a rainy night at the Rashomon Gate, the woodcutter who found the body and the priest whose faith has been shaken by the conflicting testimony at the trial encounter a misanthropic wigmaker. Together they revisit these stories, hoping to discover where the truth lies. They can’t all be true. Can any of them be true? Could it be that nothing is true? Full of swordplay, music, and movement, Rashomon is a tragic, suspenseful, provocative, and at times darkly comic tale for our times. Tickets ordered in advance are $12 / $10 for students and seniors. Tickets can be purchased at the door for $15/ $12. The Birds Have Flown And The Bones Are Quiet.